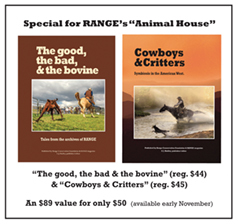 Animal House: "The Good, the Bad, & the Bovine" PLUS "Cowboys & Critters"
Home > HARDBACK BOOKS > Animal House: "The Good, the Bad, & the Bovine" PLUS "Cowboys & Critters"
RANGE's "Animal House"—two beautiful hardbacks for only $50! "The Good, the Bad, & the Bovine" (reg. $44) & "Cowboys & Critters" (reg. $45), an $89 value! "The Good, the Bad, & the Bovine" (reg. $44) only $33! Tales from the archives of RANGE. In 25 years we've seen a lot. Some beautiful and inspirational, some downright mean and ugly, And, of course, those cows...and horses and sheep and other critters. We combed through everything printed in 100 RANGE magazines and a lot that was left out. Now the best is all in one big, colorful hardback volume. 9"x11", 176 pgs. "Cowboys & Critters" (reg. $45) only $35! Our 13th hardback features works by some of the West's best photographers. It's gorgeous!